Just yesterday, we talked about some changes to the Android 4.4.2 source code reported by our colleagues at FunkyAndroid. One of the most significant changes was the removal of App Ops, a very handy utility to manage application permissions. Google Framework Engineer Dianne Hackborn stated that hiding it was intentional, as the utility was meant for internal use only by Google for debugging. While originally intended for internal use, App Ops was quite loved by many XDA users who simply like to have everything under control. Luckily, XDA Forum Member caspase decided to use his programming skills by creating an Xposed Frameworks module to bring App Ops back to Android 4.4.2! 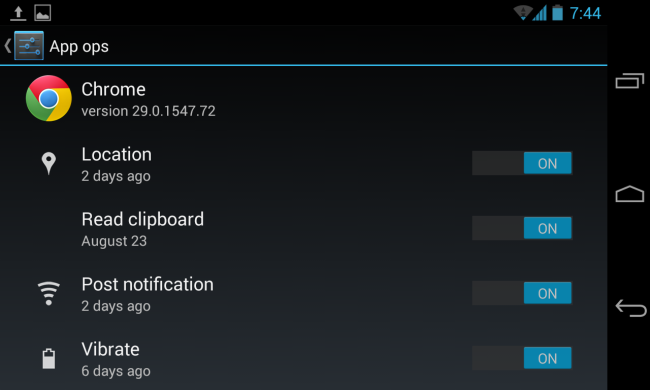 The developer describes his work as a quick and dirty hack that enables the :android:show_fragment, as well as adds the option back to the settings application. Getting into more technical language, this module reverts this commit in Settings repository. Caspase also integrated his changes into Settings app, so an external launcher is no longer required to bring back App Ops to the newest KitKat version. To use this module, your device must be rooted and Xposed Framework for Android 4.4 must be installed. You can find more information about changes, as well as the module itself, in the original thread.